Diabetes Mellitus Type II (affecting both, cats and dogs) is a disorder that affects the body’s ability to create enough insulin to appropriately regulate blood sugar levels, or the body’s ability to respond properly to normal levels of insulin. The resulting high blood sugar taxes the body, causing frequent infections. Symptoms can include increased thirst and appetite, increased urination, sudden weight loss, frequent and recurring infections, lethargy and even blindness. Breeds more susceptible to Diabetes Mellitus Type II are the Alaskan Malamute, Australian Kelpie, Australian Terrier, Bichon Frise, Border Terrier, Cairn Terrier, Cavalier King Charles Spaniel, Chow Chow, Dachshund, Doberman Pinscher, English Springer Spaniel, English Toy Spaniel, Finnish Spitz, Flat-Coated Retriever, Fox Terrier, Golden Retriever, Keeshond, Labrador Retriever, Miniature Schnauzer, Old English Sheepdog, Poodle (particularly, Miniature and Toy Poodle), Pug, Samoyed, Schipperke Terrier, Siberian Husky, Tibetan Terrier, West Highland White Terrier and Yorkshire Terrier. 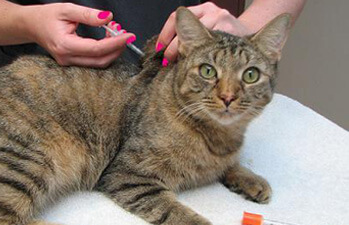 Your pet will most likely require one or two daily injections of insulin to control their blood glucose. You will need to administer these injections while working with your vet to get the dosage set properly. Stem cells “reset” the pet’s immune system. By injecting stem cells, the pet will live a longer, healthier life because their hormonal system will not be on the potential roller coaster ride that comes with the artificial regulation of insulin levels. Your pet can be treated with one or two IV injections of stems cells that can restore the body’s ability to regulate glucose levels. Therefore, your pet will no longer need daily insulin injections!